Mapping in glaciated terrains traditionally involved the grouping of landforms according to common origin and age. An excellent early example of this approach is that of Speight (1963) in the Lake Pukaki area of South Island, New Zealand. Suites of glacial features grouped as 'landform associations' essentially constituted inset sequences of glaciated valley landsystems (see below). The linking of process and form over a large area of diverse glacial landforms was pioneered by Clayton and Moran (1974) in their assessment of the spatial distribution of glacial features in North Dakota, USA (Fig. 1.1). 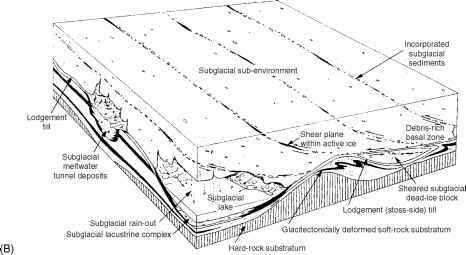 They reconstructed changes in ice dynamics during a cycle of glacial advance and recession, emphasizing both spatial and temporal landform-sediment assemblages and recognizing that glacial features can be added to a landscape as a series of layers (stratigraphy). Important advances represented by this work included the focus on glacial stratigraphy as a prerequisite to studying glacial geomorphology, the commitment to assessing groups of landforms rather than individual forms in isolation, and the recognition of process continuums. This approach, therefore, acknowledged the complexity of glacial depositional systems and highlighted the superimposition of landform-sediment assemblages ('preadvance, subglacial, superglacial and postglacial elements') in spatially coherent 'suites' (Fig. 1.1). 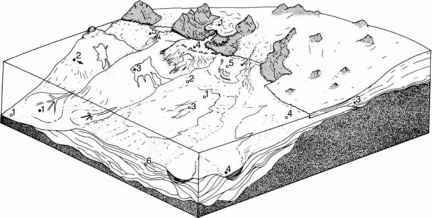 Figure 1.2 The subglacial landsystem. A) An area with hard substrate: 1 = rock drumlins, 2 = basal debris, 3 = subglacial lodgement/deformation till, 4 = lee-side cavity fill, 5 = basal till, 6 = supraglacial debris, 7 = esker, 8 = kettled outwash, 9 = proglacial sandur. 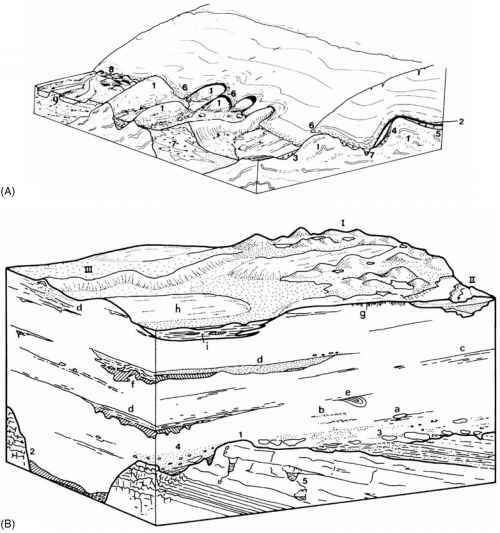 B) An area of limestone substrate covered by stacked tills: I = hummocky kame and kettle topography, II = terraced outwash incised into subglacial sediments, III = esker, a = aligned faceted clasts, b = shear lamination, c = slickensided bedding planes, d = stratified subglacial cavity or canal fills, e = folded and sheared-off channel fill, f = diapiric till intrusion into cavity fill, g = vertical joints produced by pedogenesis, h = drumlin, i = interdrumlin depression filled with postglacial sediment, 1 = striated rock head, 2 = buried channel or valley, 3 = glacitectonized rock head producing rock rafts and boulder pavements in till, 4 = lowermost till with local lithologies, 5 = cold water karst. (From Eyles, 1983a). landsystems were identified. The first was the 'till plain landsystem' which encompassed subglacially deposited tills and drumlinized surfaces. Second, the 'glaciated valley landsystem' referred to the materials produced by melting glacier ice (e.g. end, lateral and medial moraines) but excluded glacifluvial sediments. Finally, the 'fluvioglacial and ice-contact deposit landsystem' included all those landforms and sediments that are of ice-contact glacifluvial origin. These landsystems are differentiated not only by the landform-sediment assemblages that they contained but, more specifically and also on a practical level, by the engineering properties of their component materials. The Fookes et al. (1978) landform-sediment assemblages are, therefore, directly comparable with the 'elements' of Clayton and Moran (1974). Figure 1.3 The supraglacial landsystem. 1 = melt-out till, 2 and 3 = flowed supraglacial diamictons, 4 = hummocky terrain composed of kames and chaotic hummocky moraine, 5 = terraced glacifluvial sediments, 6 = failure of strata by normal faulting due to the melting of adjacent ice cores, 7 = kettle holes and small ponds located between hummocks, 8 = outwash fan fed by melting ice cores in hummocky terrain, 9 = drumlinized subglacial till surface visible through a window in the supraglacial landsystem, 10 = buried valley or infilled tunnel valley. (After Eyles, 1983a). supraglacial features (Fig. 1.4). Glaciated terrain was then mapped according to the dominant landsystems (Eyles and Dearman, 1981; Eyles et al., 1983a), providing a predictive tool for rapid assessments of subsurface materials by those involved in resource and engineering project management. Figure 1.4 The glaciated valley landsystem. 1 = oversteepened bedrock slope, 2 = buried valley, 3 = melting ice core, 4 = subglacial till with fluted surface, 5 = hummocky supraglacial debris, 6 = supraglacial lateral moraine, 7 = large angular clasts derived from rockfall onto the glacier surface, 8 = interbedded glacifluvial sediments and flowed diamictons deposited in lateral positions, 9 = debris flows caused by melt-out of ice cores, 10 = medial moraine, 11 = minor ridges of supraglacially dumped debris, 12 = lateral moraine ridge, 13 = paraglacial fans. (From Eyles, 1983a). 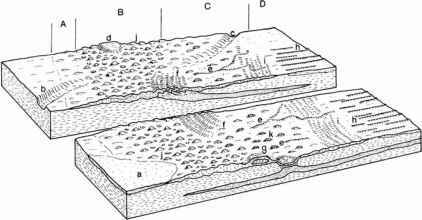 Figure 1.5 Examples of landform-sediment classification according to location. A) The supraglacial sub-environment. B) The subglacial sub-environment. (From Brodzikowski and van Loon, 1991). Figure 1.6 An example of applying primary glacial landsystems to an individual glacier margin. Lowland temperate glacier snout, Iceland. 1 = subglacial, 2 = supraglacial, 3 = terminoglacial, 4 = proglacial. (From Krüger, 1994a). 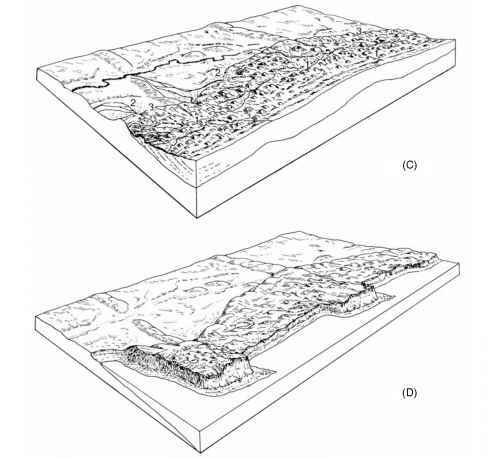 Figure 1.7 A model of moraine development due to the melt-out of debris-covered glacier ice. (From Kjœr and Krüger, 2001). 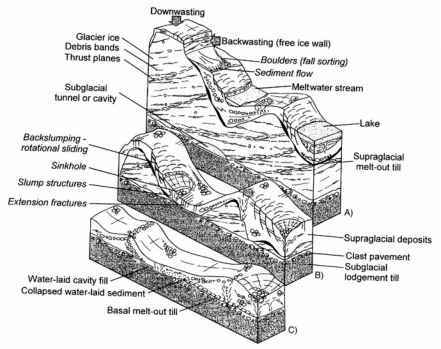 has led to the identification of landform-sediment suites indicative of specific styles of glaciation (Benn and Evans, 1998) or the impacts of certain ice dynamics (e.g. surging glaciers, Evans and Rea, 1999; ice streams, Stokes and Clark, 1999). Once a landform-sediment suite pertaining to a single period of glacier occupancy or activity can be identified, it often becomes possible to differentiate overprinted signatures (e.g. Dyke and Morris, 1988; Clark, 1993; Krüger, 1994a; Evans et al., 1999a; Fig. 1.8). 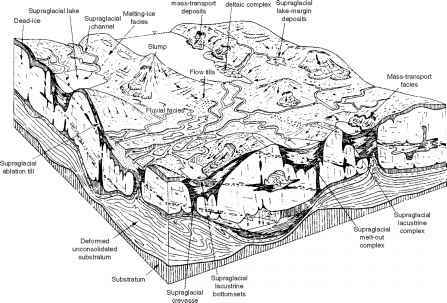 Subaqueous depositional environments were recognized in the early landsystems models as extensions of the primary landsystems (e.g. Eyles and Menzies, 1983). Additionally models of the wide specturm of glacimarine processes and depositional features have appeared in reviews of offshore environments (e.g. Eyles et al., 1985; Fig. 1.9) and have recently been given separate treatment in a landsystem context (e.g. Benn and Evans, 1998). 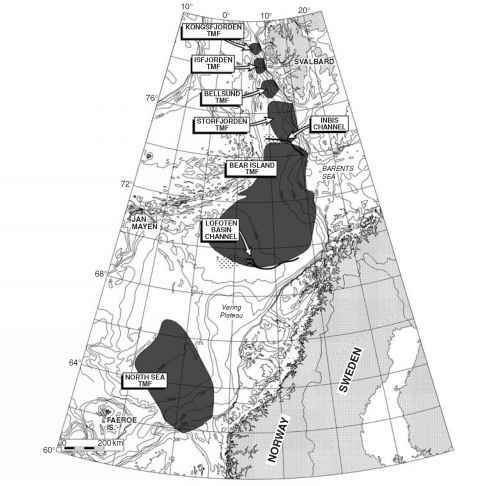 This is in recognition of the genetic linkage between sediments from terrestrial glacier systems that terminate offshore and landforms in deep water settings (Powell, 1984; Brodzikowski and van Loon, 1987, 1991). Figure 1.8 The overprinting of landform suites due to repeated glacier advances. A) Ice recession towards the east, leaving ice-contact fans (1) and an end moraine (2); a readvance then deposits a further moraine of stacked till slabs (3) and bulldozed outwash fan sediments (4); the foreland comprises A = proglacial landsystem, containing ice-contact fans and erosional terraces (1 and 5), B = terminoglacial landsystems, containing push moraines (2-4), C = subglacial landsystems, containing till surfaces and localized lake sediments (6 and 7) with areas of glacifluvially reworked material and isolated islands of subglacial till (8 and 9). B) The same terrain after a further glacier advance from the southeast. Because the glacier readvance only deposited a carapace of till over pre-existing landforms, those landforms still form the majority of the relief. Overridden push moraines and intervening meltwater corridors have been smoothed (1 and 2) and outwash plains and till surfaces have been flattened (3); some large glacifluvial terraces are still visible (4); some upstanding ridges have been smoothed into drumlins (5). C) A further, less-extensive glacier readvance from the south. Hummocky moraine develops as debris-covered ice stagnates (1) and ice-contact fans (2) are fed by supraglacial streams; an end-moraine ridge (3) marks the edge of the stagnating snout. D) The final deglaciated landscape after partial erosion by the sea or a proglacial lake. (From Krüger, 1994a). 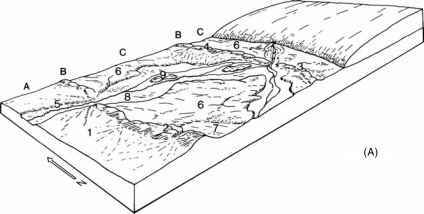 Figure 1.9 Model of glacimarine environments along a glaciated continental margin. 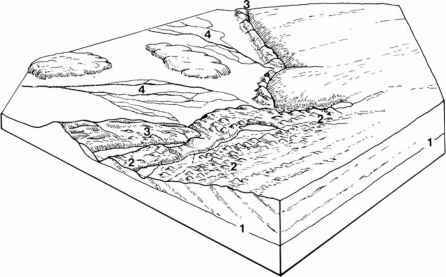 Basin margin (■): 1 = grounded terrestrial ice margin, 2 = grounded marine ice margin and subaqueous fans, 3 = ice shelf grounded below sea level and subaqueous fan, 4 = glacier-fed marine delta, 5 = glaciated fjord. 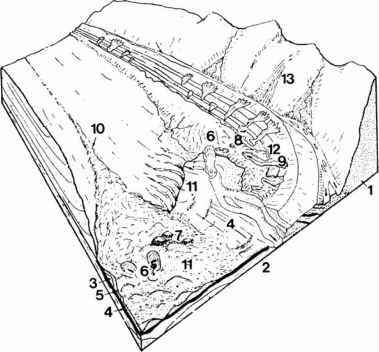 Shelf with active ice rafting (□): 1 = shallow bank carbonates, palimpsest sediments, 2 = deep bank mud and diamicton drapes, 3 = iceberg scour, 4 = sediment starved shelf, 5 = moraines left by receding ice lobe, 6 = stratiform sequences of diamicton, mud and channelized re-sedimented facies. Continental slope rise and canyons (•): 1 = glacially influenced submarine fan, 2 = upper slope contourites, 3 = downslope re-sedimentation from debris flows to turbidites, 4 = canyon fill and feeder to fans. Abyssal plain (o): 1 = pelagic sediments, ice-rafted debris, turbidites. (From Eyles et al., 1985).